A sauna, may it be a portable steam sauna or an infrared sauna, is considered a go-to place for many people to relax after work or after a workout at the gym. Studies support the existence of its great numbers of advantages, such as flushing toxins from your body and increasing weight loss. Regular use also helps you become more tolerant to heat, which improves your endurance in sports activities. To fully enjoy its benefits, you can use the best sauna essential oils that can be found online or in your local stores. These oils are known for their many health benefits, not to mention their calming and refreshing scent. 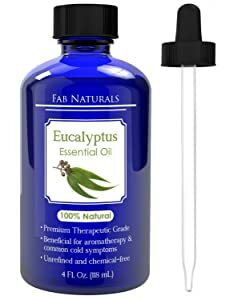 The Eucalyptus Essential Oil by Fab Naturals is guaranteed 100% pure as it comprises of all natural ingredients. 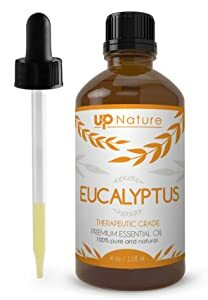 The oil’s extract comes from the leaves of an evergreen eucalyptus tree, which is professionally achieved by going through a complex steam distillation process. It is highly sustainable and environmentally friendly as it contains no fillers, additives, and any other harmful chemicals. This product is also cruelty-free. The main features of this product are its therapeutic scent and its wide utility, such as helping alleviate common problems like nasal congestion, sore throat, cough, cold, and asthma. It also has positive effects on the skin and helps relieve skin rash. Few drops of the oil could also be used to clean surfaces at home and kill mold, more so when used with clove or tea tree essential oils. It has high effective quality in treating cold and congestion. It is effective as an insect repellent, specifically mosquitoes. Thus, it is great for an outdoor sauna. The bottle is relatively huge and contains a generous amount of oil. It has a high-quality dropper. The scent of the oil doesn’t last long. The scent is relatively milder as compared to other products. This product contains pure eucalyptus extract, which creates a cooling and refreshing effect on the body. The product can be used on the face, hands, hair, nails, and skin. It’s a good substitute to common medicines in treating respiratory problems, common cold, and other related conditions. A few drops in the sauna room can help clear the head with any feeling of stuffiness. It is also a natural deodorizer, which means it could also be used in cleaning the area, as well without causing harm to the environment. The also company offers a 100% 365-day money-back guarantee. It is long-lasting without using too much of the product. The product is effective in keeping insects away. It is effective in remedying congestion and muscle pain. The product is an effective air cleanser. The dropper doesn’t work quite well as it only allows a quarter of the tube to be filled. Some products contain broken glass droppers. 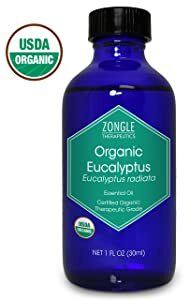 It is milder than other eucalyptus essential brands. This product is USDA certified, GSMC, and microbial tested. The ingredients of the product are 100% natural and completely undiluted. It helps relaxation and clears one’s breathing. Besides using it for sauna, it’s also used for aromatherapy, hair growth, and skin care. The product can be used in diffusers, humidifiers, linen sprays, infusers, and etc. It has a refreshing, rich, and clean scent. It is considered as one of the best essential oils with the highest quality. The product’s scent is relatively strong, thus a few drop is what it takes for a relaxing bath. It is effective in alleviating digestive problems and sore muscles. It has a wide range of utility. It tastes delicious as it can be ingested. The product’s scent might be strong for some, but it can be “watered down” by mixing with other products or water. The quality of glass dropper is relatively subpar. The product’s quality is often inconsistent as some had complained about broken parts and the absence of glass dropper. This refresher pack by EA AromaCare contains six pure blended essential oils. You can have different oils suited for different occasions. The contents of this pack include relax, sleep well, detox, rejuvenate, harmonise, and muscle relief blends. They’ve undergone Supercritical CO2 Extraction, Cold Pressed, and Steam Distillation, making them 100% pure. This also means that they are not mixed with any artificial or harmful chemicals, making them safe for the environment. Besides being used for sauna, they could also be used bathing, air freshening, and home remedies. The company also offers a 30-day money-back guarantee when you purchase the pack. The scent of each oil is calming but not overpowering. It has great packaging which makes a nice gift. Each essential oil contains a labelled hand card. It can also be used as an effective muscle reliever. Sleep well blend is very effective and favoured by many. Floral scents might be overwhelming for some customers. There were reports of leaking bottles during purchase. Lagunamoon brings you 8 essential oils that you can use for a variety of reasons. The set contains lemongrass essential oil, peppermint essential oil, rosemary essential oil, eucalyptus essential oil, tea tree essential oil, orange essential oil, frankincense essential oil, and lavender essential oil. Each has been steam distilled at low temperatures and pressures. They are 100% pure and do not contain additives. Some promised benefits are muscle pain relief, relaxation, air refresher, and for removing toxins from the skin. It is a great assortment of essential oils. It has strong scents but not overpowering. It has great, delicate packaging and is very durable. Each essential oil is very effective and of high-quality. There were reports of leakage of bottles. Reports of having “off” scents from the bottles were also reported. This new 3.38oz pure essential oil has a natural Finish smoke aroma. It can also be used in steam rooms by putting a few drops on the receptacle of the steam shower. You only need a few drops of this product since it is already concentrated. To enjoy the product, just pour the water mixture over the sauna rocks. The scent should feel up the room in a matter of minutes. Added benefits are relaxing and soothing to the body, providing feelings of comfort. It is highly effective for stress relief and relaxation. Its high concentration, which makes the scent strong but not overpowering. The scent might not be preferable for some customers. This may cause skin irritation; thus, a skin test is recommended before using the product. This 1.8oz pure essential oil is a mix of 100% pure pineapple. It is undiluted and perfectly safe for the environment. It has a sweet and tropical aroma that’s great for stress relief. To enjoy the product’s benefits, just add a few drops into the steam water. It has a strong smell but not overpowering. It gives you a cooling and calming effect. A lot of customers like its fragrance. It offers quick shipping to all its customers. The fruity scent might not prefer by some customers. The contents of oil might be small for its price. A lot of people opt to possess essential oils due to its wide range of benefits with only a few to none side effects. The history of essential oils goes way back and is used by ancestors for religious practices and as an alternative to medicine. In modern society, these oils have been commonly used in dietary consumption, cosmetics, home remedies, cleaning agents, air purification, and stress relief through diffusion. 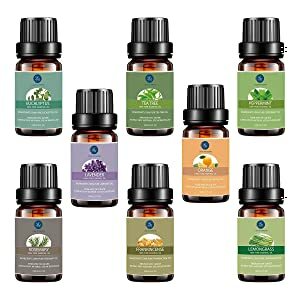 These essential oils are highly common in saunas as the steam mixed with its amazing aroma provides muscle relaxation, stress relief, and other health benefits such as relieving cough, cold, sinuses, and congestion. 1. Do not pour pure or undiluted essential oil on the sauna rocks. Make sure to dilute 4 drops with 1 litre of water before adding it on the rocks. 2. It is recommended to drink before and after going to the sauna to avoid dehydration. 3. People with open wounds or fever should not use the sauna. 4. People with health problems should first consult a licensed medical practitioner before using the sauna. Saunas are very common nowadays and are a great form of therapy due to its benefits on a person’s body and overall health. People can amplify those health benefits by adding one of the best sauna essential oils in their sauna. There are a hundred options to choose from and it’s good to first do some research before buying an essential oil online or at your local store. 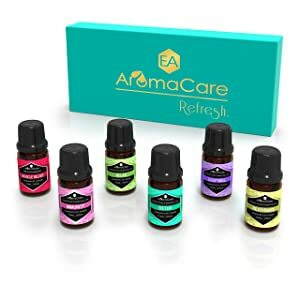 Out of the 7 essential oils mentioned above, the winner out of the bunch has to be the Aromatherapy Essential Oils Blends Gift Set by EA AromaCare. The set gives you a range of options and each bottle is of high-quality. Although it has several advantages, buying the product is a great deal as you not only get a lot of options for its price, but is also proven to be effective as a remedy to common medical problems, muscle relief, and other purposes.